Mobile Apps are one of the most competitive market segments online today. We love our Apps, our mobile devices are home to 30 Apps on average, but we tend to use the same ones on a day-by-day basis. According to recent data published by AppBrain on November 8 2017, there are 3,5 million mobile apps in Google Play, most of which are free. 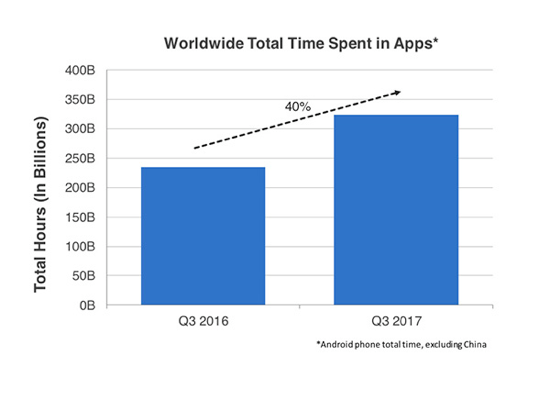 The latest report issued by App Annie (Global App Downloads & Consumer Spend Hit Record Levels: Q3 2017) shows a constant increment for the 2 most important stores both in terms of downloads and amount of time spent on the Apps as shown in the following image (fig. 1 App Annie Q3 2017). Therefore there is a great demand, which corresponds to a significant offer. Those who invest in well conceived, constantly updated mobile apps, know they can become a formidable marketing tool capable of returning strategic insights on the users. 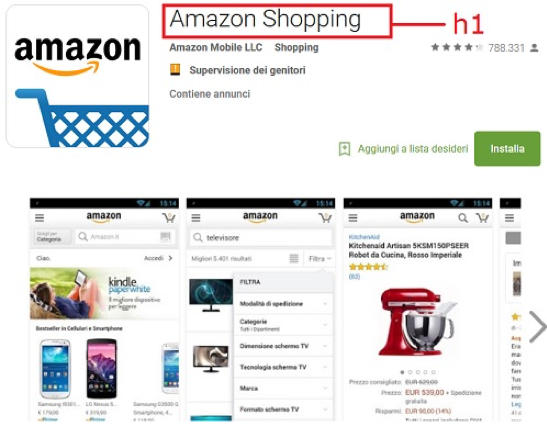 Considering the numbers and the extremely high level of competition, how can an App be visible in the store and at the same time in the search engines? The “science” which addresses these needs and studies the organic placement of Apps in stores is called ASO acronym of App Store Optimisation. ASO has many contact points with traditional SEO and those of you who deal with Search Engine Optimisation will have no difficulties in identifying and operating in this field. Just like for SEO, we are acquainted to reasoning in terms of on-page and off-page factors. If we refer to the App page it is similar to a web page containing all relevant App info. Because we cannot optimise the code of these pages to our liking, we can take advantage of all available fields to provide relevant information for ASO purposes. on-page; category name (title which becomes the title tag and h1) description, keyword, screenshot, icon, reviews, etc. off–page; download, actual usage after an update, backlink, etc. If we were to find a common rule applicable to both stores, it would be the requirement to avoid any kind of keyword stuffing which is a long-standing rule and requirement also in SEO. Both stores require users to create useful comprehensive descriptions and avoid repetition of keywords. Generally speaking common sense and logic should drive our online strategy, which in turn require experience and knowledge. There is no manual assuring better positions and organic placement in the stores, and there is no study capable of demonstrating this. However, once again, we must let logic and common sense guide us when dealing with this aspect. If we focus our attention on the exact definition of the word link which is “connection” it is easier to understand why these objects are so important and beyond their validity for SEO. Such a connection allows users to discover interesting content in any area of interest. So if we’re surfing the web from a PC and reading a forum, a blog, or any social media, we’ll get attracted to a link, especially if the link is contextual and fits our search (underlying query). If we were to find the same application from a smartphone we’d certainly download it after reading reviews or perhaps downloading directly because we recall reading “good things” about it. Downloads are an important part of ASO, as are reviews. Reviews can only come after downloads and downloads occur only once the App has been (somehow) found. This is the reason why backlink analysis of mobile application pages is what I suggest to those who are interested in creating an App with the potential to go viral and analyse the Apps of their competitors. you must be willing to invest time and money in the constant update of the app. The first aspect (app must be original) requires an analysis of the target and related needs/requirements. Creating a new App because “I have a great idea” or because “my competitors have one” is not a good idea. The second aspect is keeping the app alive with updates, reply to reviews, keep the app website/blog up to date, and make use of offline marketing techniques. Let’s put all this together in an example so we can understand backlink analysis. the update: the first app has been updated recently, the other in 2015. Now we need to focus on the other off-page factors. The Link Profile Fight Tool offers immediate insights related to a number of backlinks per application and the difference is obvious as can be seen in the image (Fig. 4 – Link Profile Fight Tool – Majestic). The first mobile application presented by the store is the one Majestic presents as the one with the biggest number of backlinks and TLDs, and it is also first in the organic results. At this point it is interesting to investigate the categories. As mentioned at the beginning of this article a link is an important opportunity to establish a relationship with a page, be it NOFOLLOW or DOFOLLOW. The value is directly related to the users. In this case as well, the insertion of a link in the most appropriate correlated category, for example, music, it is much more likely I will find users willing to download and review it. If we filter the category Music we’ll see the first application has many backlinks in this category, while the second none. The picture is clear: now let’s add the anchor text information to our analysis. For example, if we were to discover a significant amount of anchor text containing the keyword, we’re most likely in the presence of SEO efforts (professional optimisation). Same thing if we were to find in the anchor text the brand/name. There are two additional considerations to understand this kind of analysis. 1. I have intentionally avoided the names of mobile applications because simple citations can weigh in and influence online visibility. We must be careful, what is true today could not be true tomorrow. Another criteria considered in ASO is the number of recent downloads since the app has been published. Therefore, if an app were published (and given a boost with Adwords) and capable of triggering a significant number of downloads in a short time and were an app with great potential to become a top 10, the results could change. 2. This is just one of the modes, the simplest most immediate to perform this kind of analysis. If we use other functionalities of Majestic and on-site optimisation tools, it is possible to create detailed documents similar to SEO Audits for a website or elaborate competitive analyses which require a considerable amount of hours to perform. If we consider app pages as if they were landing pages from our website we would gain important insights we can leverage to increase conversions and better our online marketing efforts which ultimately help our brand. Mariachiara Marsella, co-founder of BEM Research (Big Data, Economic and Online Marketing). After graduating Mariachiara has since been occupied in the field of Web Marketing and SEO, working with important Italian agencies as SEO Specialist and as Online Marketing Directory. She has also taken part in many national events as speaker and trainer. Amazing Article. I am a User of Majestic Tool. I Shifted From AHREFS last month to Get a Change, But i Love the Interface & Working of Majestic.